Day 20: Dad and Bev arrived! I’m thankful for both of them … and the opportunity to visit this week! Family is such a blessing!! Day 21: Our “Thanksgiving Break” from school starts today … so grateful for this break from work; for the opportunity to sleep in; for time to visit with family and friends! Today we get to go out to breakfast, play in the park with the grandsons, and start cooking the feast for tomorrow! 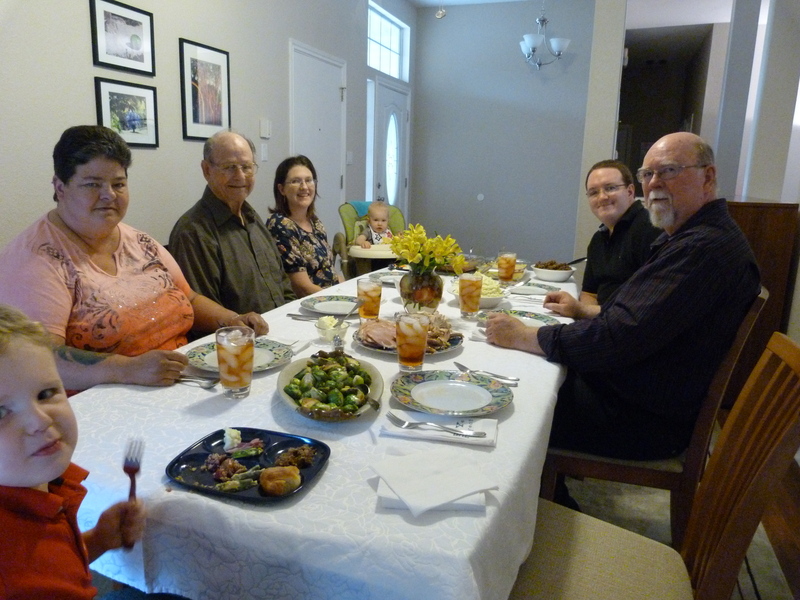 Day 22: So grateful to bring the family – or at least part of it – around the table! Love sharing good food with one another. Love the lively conversation! Day 23: I’m generally not a “Black Friday” shopper. I am particularly thankful for mail-order options! Today several packages arrived – grandsons’ Christmas gifts are mostly done! Day 24: So thankful to get to celebrate Christmas! We put up the tree today … will decorate it tomorrow with the grandsons. Today we shopped for toddler friendly ornaments. Fun to rethink the tree! We’ll take pictures when we are done! This entry was posted in 30 days of Gratitude and tagged Thanksgiving. Bookmark the permalink.